Ok, I love this! Sangria is definitely my drink of choice and your version looks amazing! Thanks Kim, definitely my drink of choice as well! Always love sangria and this looks like perfection! I’m getting ready to head out to the pool, and I so, so, so wish I had a pitcher of your stone fruit sangria to take with me! Oh it would be perfect to drink poolside! Thanks Kimberly! Sangria in the summer is a must! Beautiful! Thanks Emily, I could not agree more! I made something like this last summer and fell in love with it! The flavors of the stone fruit are just spectacular! Aren’t they? I wish I could make this year around! It’s so nice to have you as a Sunday Supper friend. 🙂 Sangria is awesome. I smiled when I saw your recipe title! You as well! Thanks Dionne! What a gorgeous sangria! I LOVE that you’ve garnished with so many of my favorite fruits! Thanks Liz, they are some of my favourites as well! Such a beautiful sangria! I love that you added plums! Thanks Sarah, they are one of my favourite fruits for sangria! Thanks Ala, I appreciate you stopping by, you have an amazing blog as well! I’m glad we have gotten to meet each other via Nancy’s blog and now Sunday Supper! I have to say being pregnant in this heat and since homes don’t have AC in them here I have really been craving drinks like this more then I did with my first child. Drinking this by a pool sounds so amazing right now. Well you could always swap out the wine for OJ or cranberry juice and you would be good to go! Stone fruits are just coming into season here and the sweet flavors are delicious! This looks like the perfect summer beverage. Thanks, there is nothing better than perfectly ripe stone fruit, that’s for sure! You had me at sangria… The first time I tasted it was my law school orientation, at this truly awful Portuguese restaurant across the street. The wine was so cheap and nasty, but no one cared. It hooked me. Just proof that you can’t really screw this drink up, lol! Haha that’s too funny! You can get away with cheap wine in sangria though, just mask it with all of the other flavours. Thanks for the warm welcome, I appreciate your comment! Thats how I feel about beer! Why have that when you can have a lovely cocktail or sangria or mixed drink?? : ) Hit this one outta da park! Yeah I can only do beer if it is light and fruity! I found a Belgian cherry IPA that is quite good but other than that I will stick to vino myself! Mal, welcome to Sunday Supper! You are going to love being a part of this amazing, warm, supportive, awesome community. I just spent my last weekend with them and they’re as fabulous in person as I knew they would be. I LOVE that your first post involves alcohol (you’re a girl after my own heart with all the chocolate and booze). Sangria is one of my favourite drinks, especially in the summer, on a patio. This looks delicious. 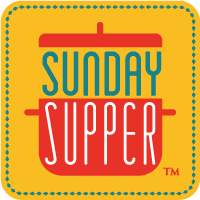 Welcome to #SundaySupper!! You can’t go wrong with Sangria and this looks delicious!